During the last few years, Full Sail has been giving lagers some extra TLC. In fact, their Session and LTD lines exclusively feature different styles of lagers. I’ve tasted, enjoyed, and written about several. 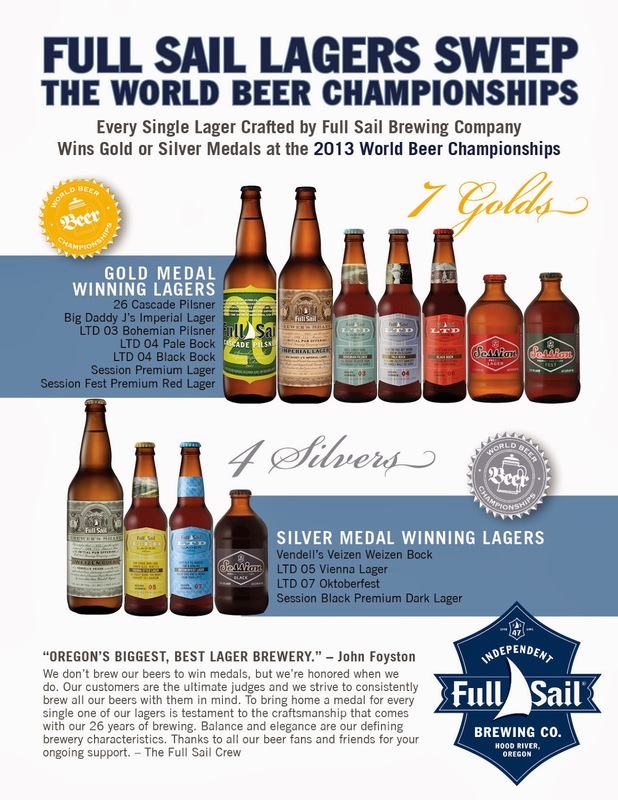 Full Sail just returned from the 2013 World Beer Championships with a truck load of medals! They earned a total of 11 medals (7 gold and 4 silvers). What’s even more impressive is the fact that every lager they entered into the competition won a gold or silver medal! Impressive, to say the least. You can see the details in the news release below. Here are the links to my reviews of some of the award-winning beers. Congrats to the Full Sail crew for this amazing accomplishment! What are your favorite Full Sail lagers? Hood River, Oregon – Seven gold and four silver medals from the World Beer Championships have just been added to Full Sail Brewing’s impressive list of awards and accolades. Every single lager crafted by Full Sail has earned gold or silver medals at this year’s competition. “This is such an extraordinary accomplishment. The sophistication and complexity of lager beers highlight a brewer’s skill and passion for quality. To bring home a medal for every single one of our lagers is testament to the craftsmanship that comes with our 26 years of brewing. Balance and elegance are our defining brewery characteristics and we’re thrilled to once again earn the highest awards for our beers,” said Jamie Emmerson, Full Sail’s Executive Brewmaster. “We don’t brew our beers to win medals, but we’re honored when we do. Our customers are the ultimate judges and we strive to consistently brew all our beers with them in mind. This is further validation of renowned beer writer John Foyston’s declaration that Full Sail is ‘Oregon's biggest, best lager brewery.’ Thanks to all our beer fans and friends for your ongoing support,” Emmerson added. The World Beer Championships are a blind tasting competition conducted by the Beverage Testing Institute (BTI) of Chicago, Illinois. The competition included beers from many highly respected brewers from around the world including the United Kingdom, Canada, Australia and the United States. Tasting notes from the competition are available at www.tastings.com. The independent and employee-owned Full Sail Brewery is perched on a bluff in Hood River, Oregon, overlooking the most epic wind and kite surfing spot in the world. At this very moment our specialists in the liquid refreshment arts are crafting barley and hops into your next beer. Among the company’s most popular brews are Full Sail Amber, IPA, Limited Lager Series, Pub Ale Series, Session Premium, Session Black, and Session Fest lagers. Founded in 1987, the Full Sail crew has been fermenting award winning godlike nectar for 26 years, and is committed to brewing great beer sustainably. The Full Sail Brew Pub is open seven days a week. Swing by for a pint, grab a bite, tour the brewery, or just soak up the view.